Inge was born on April 13, 1929. She spent her childhood in Kassel, Germany until the age of eight, with her mother, father, and older brother. Inge’s father was paralyzed in 1936 and used a wheelchair, so she and her brother, Guenther, often took care of him. Inge was very close with her father. Mr. Goldschmidt, Inge’s father, who was a World War I veteran , was very politically aware, and was alarmed by the rise of the Nazis and growing anti-Semitism in Kassel in the 1930s. He urgently wanted the family to leave Germany, but a sponsor was required. The sponsor would have to prove that he or she could support their family financially so they wouldn’t be a burden to the government in the country where they immigrated. Unfortunately, Inge’s parents could not find a sponsor for their family of four, so in 1937 they decided to move to another German city, Cologne, where they believed the conditions were better for Jews. 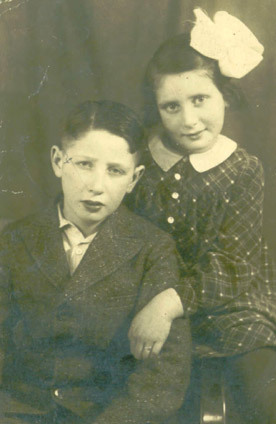 Inge Goldschmidt and her brother, Guenther, circa 1935. Inge felt at home in Cologne. She never quite realized how concerned her parents were about her safety. As a caution, for example, Mrs. Goldschmidt had asked Inge to always tell her where she was going. One day Inge went to a department store to buy a birthday present for her mother. She wanted to surprise her mother with a special gift and didn’t tell her about the trip, but she ended up having an unfortunate accident there: her finger got stuck in the escalator, and she was rushed to the Jewish hospital. When Inge’s mother heard about the accident, she ran out of the house to find her daughter, hysterical with worry. In the end, Inge was fine, but with the rise of the Nazis, Mrs. Goldschmidt was always frightened by the horrible things that could happen to her children. She had heard that the Nazis would take advantage of situations to accuse Jewish children of causing trouble. 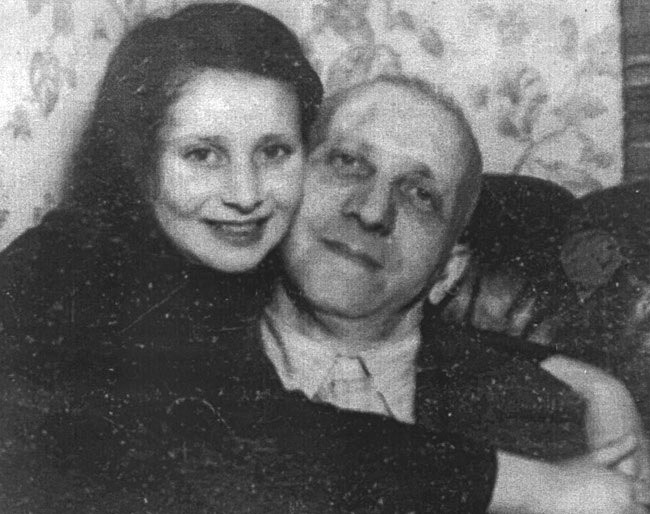 Inge and her father, Rudolf Goldschmidt, circa 1937. Inge’s parents considered themselves liberal Jews. They did not practice Jewish rituals everyday, but certain customs and holidays were important to them. They would celebrate Shabbat at home, and sometimes went to the temple . Inge enjoyed celebrating the holiday of Simchat Torah at her temple . She also enjoyed going to the temple for the special occasion of Guenther’s bar mitzvah , in July 1938. Life in Germany was gradually becoming more difficult for Jews, however. In 1935, restrictions called the Nuremberg Laws had taken away many of the ordinary rights Jews had as citizens of Germany. As restrictions against Jews continued to increase, Inge’s parents became even more worried for the safety of the family. Though they could not leave Germany themselves, Inge’s parents heard about a way for children to leave the country as refugees. They learned that private organizations were helping to bring Jewish children from Germany to the United States. Guenther left Germany in October 1938. He was sent to live with a Jewish foster family with six children of their own in St. Louis, Missouri. Inge would have gone too, but she was too young. 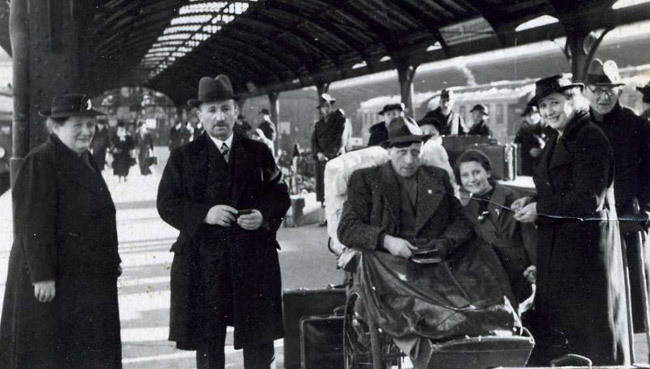 Inge with her father (in wheelchair), mother (right), and other relatives at the train station after Guenther leaves Germany in 1938.